You wouldn’t think that asking for help could be so hard. And yet we keep hearing people say they hesitate to ask for help. They don’t want to be a burden, or maybe they can’t remember what they specifically need. Then the moment passes. They may think acknowledging a need is a sign of weakness. At the root of this hesitation is fear. Fear of imposing, of appearing needy, or of over-stepping the boundaries of friendship. 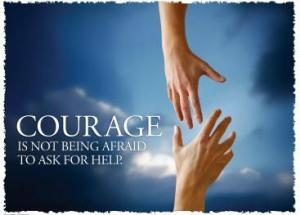 When you’re facing a crisis, however, or taking care of someone who is chronically ill, it’s time to be brave and ask for support. Toni Bernhard, JD explored the challenge of asking for help in a post for Psychology Today. She became chronically ill and unable to reliably do the things the rest of us take for granted, such as shopping for a gift for her granddaughter. It took a friend grabbing an opportunity to do a specific favor, for her to realize what it takes to ask for help. 1. They’re sincere in their offer: they mean it. 2. The responsibility falls on me, not on them, to follow-up. Our own research for Flower suggests that rather than thinking you’re a burden, your friends and family are glad when you give them something to do. Think of it as a give and take. When you ask for help, you give people the opportunity to make a difference. Plus you make it easier for them to ask for help next time they need it. So first, believe in the sincerity of your friends and family when they offer to do something for you. They’ll feel better knowing they’ve been able to do something useful. Accepting their help and offering gratitude in return lets you both benefit from an act of kindness. Next, know what you need and be specific about when you need it. Make a list (Flower has a feature called “I Could Use” to help with this). Think about each task and who might be in the best position to respond. And then it’s time to reach out and ask. This entry was posted in In Case You Missed It and tagged #icymi, caring, help, Psychology Today, support, Toni Bernhard JD. Bookmark the permalink.